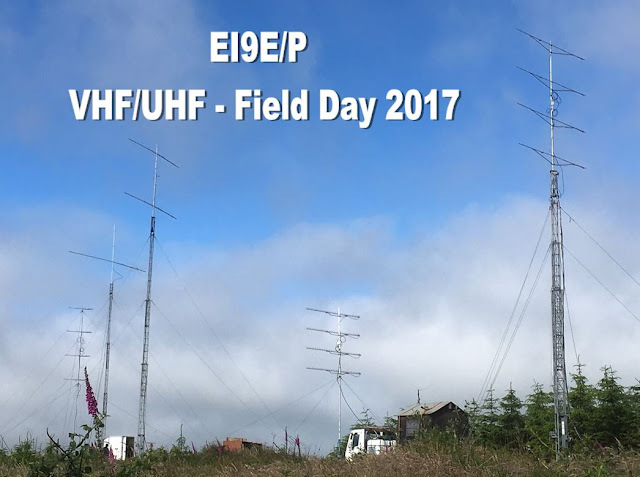 The weekend of 1st & 2nd of July 2017, I ventured out with the Wexford VHF Group for the IRTS VHF/UHF Field Day. This year we were operational on 50MHz (6m), 70MHz (4m), 144MHz (2m) 432MHz (70cm) & 1296MHz (23cm) from Locator Square "IO62OM" under the call-sign "EI9E/P". We arrived at the stations site on top of White Mountain on Friday afternoon at 15:30BST. First thing first, Lunch was prepared. Fair play to John EI2FG he put together an incredible Beef Stew with a "spicy" kick which went down a treat and certainly gave us a great start to the weekend. After lunch was demolished we began to build our portable stations for the weekend, weather conditions at this point of the day was at least dry for station setup but it did have a chill in the air especially up on the mountain top. Work began on the 6m and 2m stations where antennas were put together and erected including the 6m/4m/2m shack. Later the 70cm and 23cm stations was put together and would be finished the next morning. Once it got dark everyone got the their heads down for some well deserved rest and as soon as the sun broke at 6am everyone was up and at it. Breakfast (fit for a king) was prepared by Billy EI7FJ and Janet.... just what the doctor ordered. The 70cm and 23cm stations were finished off after breakfast and all antennas was erected and tested for the weekends contest. Everything was working smoothly and having a separate main course and pastry chef worked very well, although custard supplies were low this year and someone dropped solder flux into the Friday night stew which was the "Kick" I reckon :-). It was a very enjoyable weekend with mighty craic and it was great to meet new faces too. Thanks to everyone who beamed our way, it was fantastic to work you all.